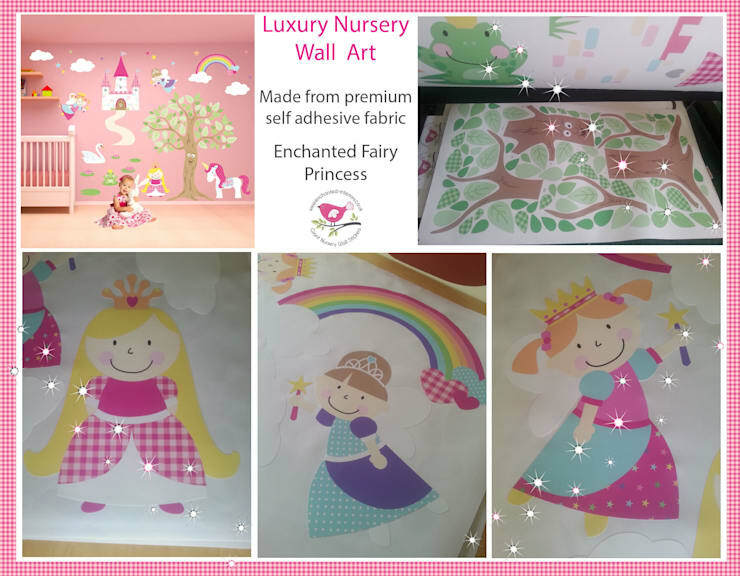 Deluxe Enchanted Fairy Princess Luxury Nursery Wall Art Sticker Design Made from Premium Self Adhesive Fabric simply peel & stick to create an engaging feature wall setting within hours in your baby girls nursery room. Featuring some of our most magical fairytale characters and elements—fairies, princesses, unicorns,an enchanted tree, castle and colourful rainbow. Deluxe Enchanted Fairy Princess Luxury Nursery Wall Art Sticker Design. Made from a premium self adhesive fabric simply peel & stick to create an engaging feature wall setting within hours. Featuring some of our most magical fairytale characters and elements - fairies, princesses, unicorns, an enchanted tree, castle and colourful rainbow. Included in the deluxe Enchanted Fairy Princess Luxury Nursery Wall Art Sticker Scene are over 110 self-adhesive extremely high quality fabric nursery wall stickers for applying to any smooth surface. Our stickers can be repositioned and removed leaving no residue on the surface.